The moniker that bloomed into a legendary persona and universal star. 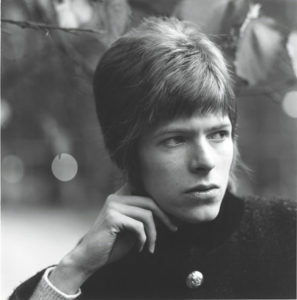 Indeed, David Bowie was first credited on a single called “Can’t Help Thinking About Me” on January 14, 1966. 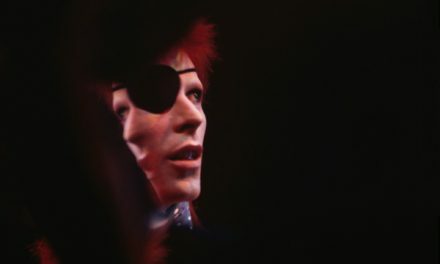 It was his fourth single, but his first as Bowie. David Bowie, 1966. Photo by David Wedgbury. I’m pretty certain you’ve never heard of that song. I hadn’t even heard of it until this week, and I count myself as a rather large David Bowie fan! It’s easy to fall under the mistaken belief that David Bowie emerged fully formed from his own forehead. If you’re a Greatest Hits fan, or just someone who has never fell down the Wikipedia hole too deeply, you’d be perfectly reasonable in thinking there was some olden-days EP containing “Space Oddity,” “Man Who Sold The World,” “Changes,” and “Life On Mars” and then Bowie as we all love him exploded into being on Ziggy Stardust. That’s not the case at all. 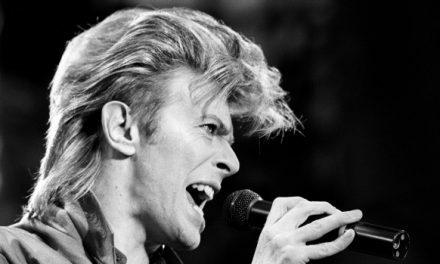 David Bowie spent eight years as a recording artist before the release of Ziggy Stardust and the Spiders From Mars. He released a pair of glam albums before that. He had an entire folkish pastiche of an eponymous album prior to his more well-known eponymous album in 1969, later rechristened Space Oddity. And, even before that, for three years he issued a string of unremarkable vinyl singles. He began at the tender age of 17. Thus, that is also where we’ll begin in my epic chronological listen to David Bowie. This post covers his first single in 1964 to material from before his first album in 1967. 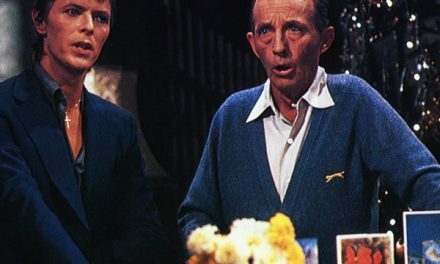 Young David Jones first appeared as a member of The Kon-Rads, who recorded for Decca but were never officially signed or released. His first release as a bandleader was a 1964 single called “Liza Jane,” as performed by Davie Jones with The King Bees. The song itself was much older than young Mr. Jones. It was written in 1910 by Countess Ada de Lachau and became a standard (here’s Nina Simone singing it). Bowie’s version is a sort of unremarkable post-Skiffle British R&B that the Beatles had perfected in the past year. It’s fascinating to think that 17-year old David Bowie cut this single after a year of likely hearing non-stop John, Paul, George, and Ringo on the radio. This is unsophisticated, by comparison, with its gallumphing lead line and wheezing sax (yes, played by David Bowie). but that’s no different than today. Someone breaks through on the radio with a new genre, and the next year a heap of imitators clumsily follow their lead. The B-side of that release was “Louie, Louie Go Home,” originally recorded by Paul Revere and the Raiders as a sequel to their famous “Louie, Louie.” The King Bees’ version sounds like a decent teenage band in a garage covering one of their favorite songs but not really being sure how to end it. Their cacaphonous shouting of staccato “home home home” backing vocals is charming, but there’s nothing too memorable here. You can pick up “Liza Jane” on Bowie’s Nothing Has Changed retrospective – it is the final track. 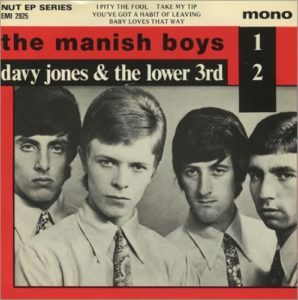 Bowie’s next incarnation was “The Manish Boys” in 1965, which issued one single: “I Pity The Fool” b/w “Take My Tip.”The A-Side, “Fool,” was a cover of a 1961 Bobby Bland tune. It iss straight-up blues and, if you think about it, the closest David Bowie has ever really got to the blues was when he sang that one line in “Let’s Dance.” That should tell you how good this effort his. He doesn’t have the gravity in his delivery to make this remarkable. He sings in the reedy high-end of his baritone, and a hyperactive lead line thinks its adorning another song entire. Once again, it’s the saxophone that steals the show, though we can’t necessarily credit Bowie – there are multiple horn players on this cut. Totally normal English beat song and then all of a sudden we’re playing with a the [something] who possesses the sky. Despite all of our desperate wishes that David is singing “Spider” so we can call this song the secret origin of Ziggy Stardust, I’m pretty certain he says “tiger.” Still, that is a pretty bizarre line in an otherwise totally normal song. The vocals here remain adolescent, but he’s beginning to sing in that slightly-nasal, cutting way he’d use on later choruses. Also, there is a brief drum break with chromatic changes in the middle that definitely hints at future arrangements. This pair of tunes appear on a Bowie! 1965 MP3 release from Parlaphone. From The Manish Boys, later that same year we hop to Davy Jones (& The Lower Third). Clearly he was going with the “Davy Jones” name before The Monkees hit it big. Their first single was “You’ve Got a Habit of Leaving” b/w “Baby Loves The Way.” Both are Bowie writing credits and are both inoffensive, at best. He has abandoned his R&B sound of the prior single, but he hasn’t replaced it with much else. He tries on a cutesy, whiney boy voice that must have been popular on the radio at the time. The interesting thing is the entrance of a fuzz bass on “Leaving” that leads to major psychedelic breakdown in the middle of the song. Despite some fluttering harmonica, it’s legitimately heavy – but just as it settles in to a groove, out pops the acoustic guitar from the other side. By contrast, “Baby Loves That Way” is super-vanilla, aside from a lovely little reverb guitar chord intro. Both songs appear on the Parlaphone Bowie! 1965 EP. I located another handful of songs that profess to be “Davy Jones with The Lower Third” tunes. They are “Glad I’ve Got Nobody,” perhaps a bit more Who-flavored than the prior two, and “I’ll Follow You,” which feels a bit like the throwback-y Beatles tunes like “Mr. Moonlight.” It’s very Sonny and Cher, but his plaintive singing is enjoyable. There’s a hint of some of the fluidity and grit to come. There’s another obscure tune, “Baby, That’s a Promise,” which isn’t on any compilations though it’s easily findable on the web. It’s one of the catchier and better-performed of the songs of this period. 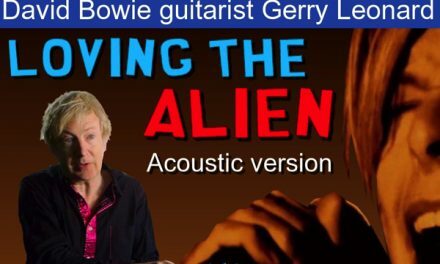 A delightful, throaty vocal from Bowie shows some signs of his fine vibrato and falsetto. Bowie then discarded “The Lower Third” (by the way, such a bad name – does that refer to them singing his underneath harmonies? Here’s some history on them) in favor of backing band “The Buzz” on “Do Anything You Say” b/w “Good Morning Girl.” Of the lyrical vomit and scatting on “Good Morning Girl,” I will say nothing further, but you will immediately recognize the throaty baritone on “Do Anything You Say.” It sounds like Bowie of five years later. It was b/w “I’m Not Losing Sleep,” which is in the same vein but with a lower vocal that is a bit reminiscent of Tom Jones. The melody on the chorus of “I’m just counting sheep, I’m not losing sleep, my friend” is a bit catchy. 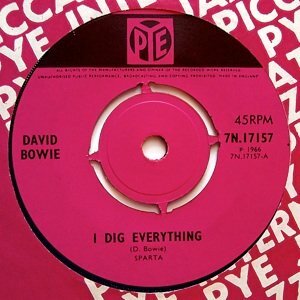 All of the Pye songs are available on I Dig Everything: The 1966 Pye Singles, more cheaply had as MP3s than a physical CD. I wonder if David Bowie had many fans from this string of singles in the UK, following him from band name to band name. Earlier this week, Bowie’s response to fan letter from 1967 circulated and mentioned a British fan club. However, that was from September of 1967 after his solo full-length debut on Deram Records – but that’s a topic for another post! Listen to David Bowie imitate .